​​Everton travel to Vicarage Road to take on Watford on Saturday afternoon, with both sides neck and neck in the top half of the table. Watford have only tasted defeat twice in their past seven games but only picked up one win during this spell. Javi Gracia’s men drew 0-0 with Brighton on Saturday to remain above Saturday’s opponents Everton. The Toffees head into this one on the back of some mixed form, winning two of their past six games with four defeats. ​Everton lost 2-0 to Manchester City at Goodison Park on Wednesday, thus missing the chance to climb above Watford. They also bowed out of the FA Cup to Millwall recently. A late goal from Murray Wallace gave the Championship side one of the shocks of the round. Both sides are currently in the running for the seventh place finish that could provide some European football next season giving this match the potential to be a thriller. Check out 90min’s preview of Saturdays clash below. ​The visitors face no new injuries following their defeat to ​Manchester City on Wednesday. Leighton Baines missed out after he was subbed off last weekend against Wolves, Lucas Digne replaced the veteran left back on Wednesday. Yerry Mina will also be unavailable for selection this weekend. Abdoulaye Doucoure, Kiko Femenia and Sebastian Prodl all missed out for Watford during the ​0-0 draw with Brighton and it is unlikely any of these players will make a return this weekend. ​Watford ​Foster; Holebas, Cathcart, Mariappa, Janmaat; Capoue, Cleverly, Sema, Hughes; Gray, Deeney. Watford have only beaten the Toffees four times in their last 27 encounters. On recent form though, it looks like a hard fought draw could be on the cards. The last meeting ended in a ​2-2 draw at Goodison Park in December. Richarlison gave Everton an early lead before two quick second half goals put the Hornets ahead. Watford were heading for the three points but an injury time free kick from Lucas Digne rescued a point for the home side. ​Watford have only lost one of their last five league fixtures, but they have only managed one win during this run. Two goalless draws and a 3-3 draw with Bournemouth have, however, kept the Hornets within touching distance of European qualification. Everton have struggled to win two games on the spin since October, their past three victories have all been followed by a defeat. ​Here is how both sides have performed in their past five fixtures. ​Watford have played their last three games away from home, and could up their game returning to their home crowd. Everton, on the other hand, need to get back to winning ways after two defeats in a row. 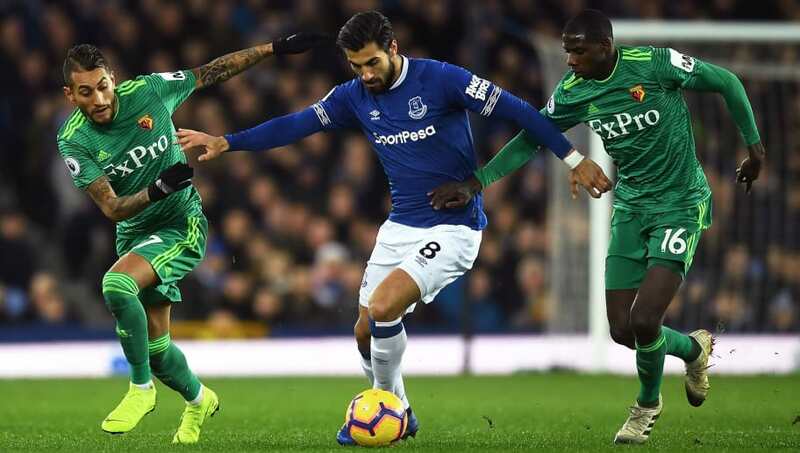 Everton and Watford will both look at this fixture as a must win to keep within touching distance of European qualification.